The banked track coalition heads for San Diego in its seventh annual tournament. Get all the details here! As roller derby rolls through the spring and summer, anticipation builds as fall approaches. The autumn months are when the roller derby championship season begins in earnest, and is when all eyes are on flat tracks around the country (and world!) to see what teams are the best of the best. For the impatient lot, the Roller Derby Coalition of Leagues has plopped its national get-together smack-dab in the middle of the year. Thanks to them, we don’t need to wait to see some bracket-busting action. We can have it right now! This weekend, June 6-8, Battle on the Bank VII takes place in San Diego. The five founding member leagues of the RDCL, along with two guest leagues, a host of juniors, and for the first time a pair of men’s teams fill out the three-day national banked track tournament. Banked track derby has been through a rough stretch as of late. Over the past several months, a handful of leagues have been forced to seek out or move to a new location, forced to mothball or sell their track, or forced to shut down altogether. There aren’t many banked leagues to begin with, so when things like this happen to a few, it affects the many. Even so, the spectacle of banked track roller derby is hearty, and even during trying times it continues to succeed in many places. There is much good news to report on in this year’s battle. A team new to the tournament is getting a third chance to make a second impression. A team still-new to RDCL play is getting a second chance to get their first win. Two teams no strangers to each other are getting ready to mark a roller derby first for the second time. While victory seems inevitable for the coalition’s powerhouse, the middle placings may all be in play among the teams returning to the tournament. That’s good news for fans, since the roller derby played in the RDCL can be downright incredible when the wheels hit the Masonite in a game between level participants. Though tournament participation is down this year, there is a still a healthy number of teams ready to duke it out in downtown San Diego across 17 half-length and full-length games. Live streaming coverage is being provided by hosts San Diego Derby Dolls for free through the live stream page on the Battle on the Bank website. 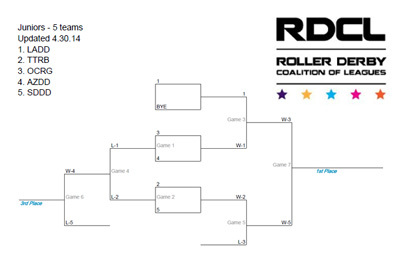 The full game schedule and adult brackets are available below, followed by a comprehensive preview of who’s who in the tournament, the kind of gameplay to expect on the banked track, and the current state of RDCL in general. Click to download the printable PDF bracket. Spoiler alert: The L.A. Derby Dolls are going to leave San Diego with another champion’s engraving on the Battle on the Bank trophy. It’s one of those inevitable things, you know? As the biggest fish in a small pond, it’s almost unfair to the competition that there isn’t someone their size in the banked track community to stand up to Los Angeles. In the early years of BotB, the playing field was more level. But not recently. Some years, rivals get close to beating L.A.—sister league San Diego Derby Dolls almost knocked them off two years ago in Seattle. Other years, superteams knocked them off—Team Legit won it all in Arizona three years ago. Regardless, the Ri-ettes come into the event as double-defending champs, and this year there isn’t much in the way of resistance. Their two traditional rivals, San Diego and Arizona, went down hard in recent interleague play. Really hard. So hard, the games finished up in two of the worst Doll Factory blowouts since the start of the 2013 season. LA wraps up a predictable win over Arizona's Hot Shots 283-78. AZ still needs some work on blocker offense and their jmrs taking cheap pens. Normally, LA/SD Derby Doll derbies are hotly contested. Tonight, no. Final score: LA 324, SD 45. The game was as good as the score suggests. The full L.A. all-star team has had to instead turn to teams outside of their circle for real competition, and this year they’ve found it. They won against V-Diva and the Pennsylvania All-Stars in a titanic 191-52 slugfest between matched teams. Mash-up squad Team Wolfpack took advantage of unusually sloppy L.A. play and actually beat them 138-126, handing the Ri-ettes their first banked track interleague loss since the RDCL eliminated slow derby shenanigans from its rule set at the end of 2012. Still, the lack of consistent competition has changed L.A., both the league and the city. Several top skaters have already jumped ship to Angel City and the WFTDA. This year many top LADD skaters have stepped away from the all-star team, preferring to focus exclusively on the home intraleague season. Some have retired from derby altogether. Despite the roster turnover, the Ri-ettes still remain strong thanks to a steady stream of new talent and the knowledge of experienced veterans. Relative newcomers to the team, like The Jeneral and Hunnie Brasco are already making big impacts. Long-time LADD members, like RegulateHer, Laguna Beyatch, and Gori Spelling, hold the team together as a tight, cohesive unit. All of this adds up to the reason why the L.A. Derby Dolls are poised to take home a third straight banked track championship trophy. San Diego last hosted Battle on the Bank all the way back in 2010. Battle on the Bank III was won by the host league over Team Legit, San Diego’s second in a row at that point but last title since. BotBIII was memorable for very physical play. The third-place game between Los Angeles and TXRD of Texas was particularly brutal, with many skaters spilling out of the track. But the one moment that stands out from that weekend was during an early game in the bracket, when L.A. was cruising through a preliminary game against the San Diego B-team. This year, odds are better that the rails will be strong enough to contain those players who may be directed towards it at velocity. The San Diego Derby Dolls have spent the last several weeks upgrading the facilities at their downtown warehouse facility, adding bleachers for fans and further spiffing it up for tournament weekend. Presumably, this work includes sealing up the track’s recently exposed infield pit of death. Not to be confused with an alligator pit. Last time Battle of the Bank came through San Diego, we almost lost a skater. Hopefully we won’t lose any players or infield personnel to further gravity calamities! On a less humorous note, OC and Tilted Thunder have both been making big strides in a bid to move up the ranks in the RDCL. There’s more relevance in looking back to San Diego 2010, because Battle on the Bank III was the year Tilted Thunder made their tournament debut. It wasn’t a very good one—you could tell that the team at that time was very inexperienced and grossly unprepared for interleague play. No one was surprised that they finished eighth place out of eight teams that year. But every year they have been getting better. Noticeably better. Travelling to Phoenix for Battle on the Bank IV, they won their first game and finished seventh. Hosting Battle on the Bank V, they hung with a stacked Team Legit in a spirited game and finished fifth. Last year in Los Angeles, an epic clash saw Tilted Thunder hold off OC in the last jam, using spooky-good teamwork to get the job done on the way to a fourth-place overall finish. Today, the Rail Birds are one of the more healthy banked track programs, boasting a competitive home league with four teams and a juniors squad that’s right up there with the best of them in the RDCL. Though their geographic isolation can work against them, the fact that they’re in one of the most talented skating regions in the country makes up for that nicely. If further training means yields even more improvement, promotion to a podium finish is not out of the question. Further south, the OC Rollergirls have been making strides of their own, recently winning the San Diego Derby Dolls league championship. Yes, that’s right: One league has won the league title of a different league. Congrats to @OCRollerGirls Blockwork Orange ~ 2013 Champs!! Of course, OC beating local San Diego squads one-third the power of the main all-star team doesn’t say much about their prospects heading back to the Dollhouse. What does, is Blockwork’s 150-162 close loss to a full-power San Diego all-star team a few weeks ago. This is the first time in a long time that one of RDCL’s traditionally “low tier” teams has gotten that close to toppling a top-three power. This potential changing of the guard has a lot to do with OCRG’s top player, Miss Vicious Applicious. One of the most dynamic forces in the RDCL, it’s pretty much a guarantee that she will make an impact on every play she’s involved in, either defensively or in the occasional offensive appearance she makes. She’s one of those players that makes it impossible to forget she’s out there. Just one problem: There’s only one of her. If OCRG is going to break through to the next level and start competing for second- and third-place finishes, the team is going to need a second or third player of her caliber. Some of their prominent jammers, like Pinky Pokerface and Molly Rinkwall, show promise. But in a recent tune-up game against one of LADD’s home teams, those same jammers were playing as if they were hoping for someone else to make a big play. 2 things: 1) Out of 60 total jams OC jmrs insta-called off 9 heinously early. 4 of those wasted clear scoring chances. Gotta go for it more. That game ended up in a 150 point blowout, so those wasted jams wouldn’t have made a difference in the final outcome. However, last year’s 30-minute BotB game between Tilited Thunder and Blockwork Orange ended 62-61, in favor of Seattle. Battle on the Bank VII will continue the trend of super-close games, so OC will not get away with continuing to avoid contested scores. If it wants to break through to the next level, it had better figure out a way to squeeze every drop out of every scoring chance the Orange finds itself faced with. There’s only one thing better than junior roller derby: Banked track junior roller derby. 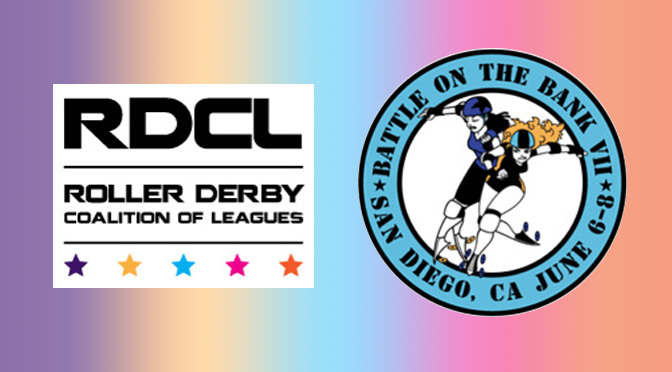 The five member leagues of the RDCL are bring their kids to San Diego for a five-team junior tournament, with junior games being prominently featured on Saturday before the big girls take to the track that evening. Entering the fray this year are are the L.A. Jr. Ri-ettes, Tilted Thunder Rail Peeps, San Diego Dollinquents, Arizona Minor Assaults, and the OC Slice Girls. 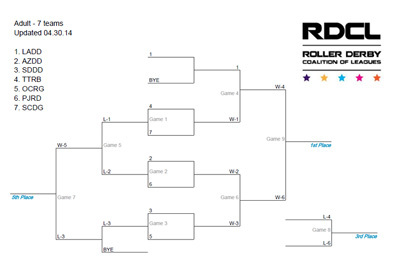 Click to download the printable PDF junior brackets. Unsurprisingly, the L.A. Junior Derby Dolls are the favorites to repeat as treble-champions. Two years ago they defeated the Rail Peeps on their home turf in Seattle, and last year the Jr. Ri-ettes defended their own home track by beating the Peeps again in Los Angeles. The resources that Los Angeles has available to them means its juniors will likely remain a top contender for as long as the senior team does. Last year L.A. began a junior intraleague program, creating four “Jr.” versions of its four existing league home teams. This year, the junior all-stars traveled north to take on the powerful Rose City Rosebuds on the flat track. Although they got doubled up—as did the adult Ri-ettes against the Wheels of Justice when they played the same day—what a luxury it is to be able to go out to where the good teams are. Then again, it helps to be based where those same good teams are. The Tilted Thunder banked track juniors program has been right up there with the one in Los Angeles the last few years, if their repeat finals appearances are any indication. However, last year’s score in the junior final was 209-100. A distant second, but second place nonetheless. San Diego and OC Rollergirls aren’t just working together with their adult teams, but their junior teams, too. The leagues’ proximity to one another means it’s easy to throw in a juniors game between them to start off a doubleheader any time the big girls have at it. The Dollinquents have gotten the better of the Slice Girls a couple of times this season, their most recent meeting ending 241-163. This leaves the Minor Assaults as the odd one out, the team most isolated from its junior RDCL counterparts. There are enough brats in the Arizona program to build two juniors teams that play against each other, but outside of the flat track juniors they occasionally cross paths with it’s slim pickings for interleague banked track experience. However, like the adult league, it doesn’t seem to affect their ability to compete a great deal. SDDD’s juniors might upset them based on their games against OCRG, but expect the ‘Zona young’uns to put forth a good effort this weekend no matter what. Last year at Battle on the Bank in Los Angeles, when San Diego and Arizona went against each other, they produced two of the greatest head-to-head match-ups in the history of the tournament, and dare it be said in the history of the Doll Factory. Both teams were extremely well-matched, both had high levels of talent available at their disposal, and both won games that came down to the final jam. San Diego wins! 80-71 the final, in a pure thriller. Final: @azderbydames Hot Shots 128, San Diego @derbydolls Wildfires 112. AZ moves on to the championship final vs. Los Angeles. What a game! This year? Well, this year stands to be different. Many top players from both teams that made those games so great have moved on to greener pastures, and the Wildfires may have been hit with the biggest losses. San Diego hasn’t yet built up the depth of their sister league to the north. Both Derby Dolls teams have recently lost many years of high-level experience, but only Los Angeles has good players ready to step in and compete at the same level. L.A.’s 324-45 win at home against their I-5 rivals in February tells you all you need to know about that. Their shaky performance against The OC tells you more. The lack of cohesion in the pack is has probably been San Diego’s biggest weakness, something that only leadership and experience can ultimately fix. However, that’s tricky for a team that currently has but few players with more than four years of banked track all-star play, Assaulty Cracker and Slamurai among them. The majority have less than two on the A-Team, and no amount of practice or training is going to change that. The future is looking bright for San Diego, at least. This year it has added a B-Team to their league roster, a team that has already picked up a win and looks ready to get some more. In a year or two, some of those players may get promoted to the Wildfires. When that happens, SDDD may return to being a perpetual threat to win Battle on the Bank, as they were in many previous years. This year, however, there is a very real chance that they might not even place in the top three, something that has not happened to them since 2008. How far San Diego falls will have a lot to do with how high the Arizona Derby Dames can remain on the totem pole this year. The Hot Shots lost a very good jammer in BotBVI MVP Goody Goody Blooddrop. However, Ellie Mayhem and The Lap Dancer are still around to anchor a good jammer rotation. Despite this, Arizona too is in some danger of falling out of the top three. Arizona’s weakness also lies in the pack. However, it’s not because of lack of game experience. Rather, lack of tactical know-how. Throughout last year’s tournament and in their game against L.A. earlier this year, Hot Shots blockers continually favored to drop to the rear of the pack, deliberately gifting their opponent front pack dominance. While that may be a smart play in other forms of roller derby2, in the RDCL it’s generally ineffective, especially against a strong blocking team and/or in close jammer races. Doing so throws away potential scoring chances and ruins opportunities to get maximum points in the clear chances they do generate. Many times their blockers make themselves vulnerable to get scored on before their jammer gets past opposing hips, even while holding lead on the jam. This is part of the reason why last year in 30-minute games Arizona lost to San Diego in the last (Most Interesting in the World) jam and nervously beat OC Rollergirls 86-71. There is a ton of talent in the Derby Dames, and when they put it together they can win the games they are supposed to win. A solid 184-136 home victory over the Orange a few months ago is a testament to that. Then again, that’s a smaller margin of victory than when OC and AZ clashed in 2013. Plus, the relatively high points total Arizona put up suggests a lot of ghost points and power jams made things easier for the Hot Shots. Should the two teams meet again in a cleaner game, or perhaps if Arizona and Tilted Thunder cross paths, an upset would not be outside of the realm of possibility. Despite this, Arizona is still the favorite to take second place. Blockwork or the Railbirds could surpass them, but only if Arizona stumbles badly or fails to make necessary strategy adjustments in-game. The final placings for positions 3~5 are more open for debate than they have been in years’ past; whether or not that debate can be extended to placings 2~5 has everything to do how with whether or not the Hot Shots can avoid shooting themselves in the foot. Since Battle on the Bank is often the only banked track action the derby community will take in all year, and the RDCL game is much different than the style of game most flat track players are used to, it’s pertinent to update everyone on the major changes to RDCL rules from last year to this year. A lot of changes to need to take in all at once, I know. But seriously, last year’s RDCL rules update hit such a sweet spot that no significant gameplay changes or any major clarifications were required for this year’s rules revisions. An early-year update, v2.4, went through a quick trial by fire. Further tweaks were finalized and the v2.5 rules (available here) were approved last month for use in this weekend’s tournament. The 2013 changes worked out so well in part because RDCL derby virtually eliminated passive offense strategies from gameplay.3 By forcing teams to stop each other on the track with blocking, rather than stopping each other in the rules with loopholes, many previous rules frustrations naturally resolved themselves through gameplay. There are no destruction of pack or immediate failure to reform penalties in the RDCL, so blockers gaining the front of the pack have the ability to deliberately skate it forward and legally initiate a speed increase. The pack is still compelled to reform within 2 seconds (down from 3 seconds last year) but during this time an engagement zone perpetually exists. There is no such thing as a no-pack situation in the RDCL; they signal instead “split pack,” the arms-up warning to players to snap back together. This change puts the offense-defense balance back into pack play, and is the reason why a team like Arizona can get burned by playing passively. Dropping back and splitting the pack will only temporarily neutralize pack speed. It will do nothing to weaken a front defensive wall which all of a sudden does not need to bridge. As long as the front is actively engaging a jammer, the only thing that will weaken their defense is an offensive blocker assist. Including during power jams, where a team that doesn’t have a jammer to defend is still forced to play defense against the other team. If they can capture a goat, they can control pack speed and score good points. If a goat gets away, they lose speed control and may not score anything. Power jams are no longer a guaranteed score in the RDCL, because defenses can still play a form of “offense” to counter them. With 60 second jams, dynamic lead jammer positioning, a requirement that the lead jammer be in-bounds before she can call it off, jam-length penalties enforced during (often-truncated) reset time, and a required forward motion rule that complements the natural drive to stay ahead of the other team, RDCL derby rules have hit a nice balance point. There will be very few rules-related stoppages at Battle on the Bank VII for this reason. In case you needed another: Teams that lose an official review challenge also lose a timeout, which helps to keep games moving along nicely. As the RDCL does every year, non-affiliated banked track leagues are asked to participate in Battle on the Bank. This year sees two teams accept repeat invitations to the big show. However, only one of those two teams actually got to use that invite last year. The Salt City Shakers attended Battle on the Bank V in Seattle and were supposed to make their second BotB trip in 2013, but had to withdraw the week before the festivities kicked off in Los Angeles, citing the dreaded “reasons beyond our control.” Although those reasons were never specified, financial hardship was likely the culprit. SCDG has existed since 2005, which is just as long (or longer) as some leagues in the RDCL. That longevity helped them achieve the transition from flat to banked a few years ago.4 The search for a more permanent practice facility in the Salt Lake City area has been ongoing for some time, however, an issue that many banked leagues are facing today. Whatever caused them to scrap last year’s trip was probably related to that in some way. Last year’s absence wasn’t a total loss, however. The Shakers’ head referee, Sports Bra, was able to make another trip to BotB and pick up more interleague officiating experience. That’s worth its weight in gold for banked track leagues which are few and far between outside of the Southern California area. Given that Salt City rarely gets out aside from tournament time, they are an unknown quantity heading into Battle on the Bank VII. But at least they’ll be that little bit more prepared than they were before. So will the Penn-Jersey She Devils. Philadelphia’s original roller derby league houses the only active banked track in the northeast, and has years of skating experience on it. That would normally be a great advantage, except Penn-Jersey is a Modern Athletic Derby Endeavor league that had never seen or played by RDCL rules until the few months before they entered Battle on the Bank VI. Long story short, last year the She Devils played like they were a fish out of water. In their first game against San Diego, they were committing penalties so frequently that it’s a miracle they finished with any players. Even when they had full packs or were gifted power jams, the best they could do was to get their jammer out on an initial pass before time ran out. The game ended in the biggest blowout in RDCL-rules history, 214-4 in 30 minutes. After 29 minutes, the score of that game was 214-0. In a last-jam power jam, PJRD finally lapped the pack and scored four of the most celebrated points in Battle on the Bank history. In a wonderful show of sportsmanship, the Doll Factory gave the She Devils a standing ovation at the end of the game. After a much better showing against the now-defunct Sugartown Rollergirls in an 87-56 loss, the team returned to Philly with their heads held high. Not only that, they’ve gained a new perspective on roller derby. Since last year, Penn-Jersey Roller Derby has expanded into a poly-setual league. Though they still play MADE derby regularly and are in no hurry to change their primary affiliation, PJRD’s men’s team, the Hooligans, are on the verge of joining the MRDA this year. A little help from the guys in pushy-shovy derby, plus twelve months of RDCL practice, is sure to put the She-Devils on the path to their first win in star-pass roller derby. A bit of history will be made in San Diego on Friday night, as Battle on the Bank VII will for the first time host a full-length men’s exhibition game between San Diego Roller Derby Aftershocks and the Phoenix Rattleskates. Earlier this year, the Rattleskates took on the Hot Shots in a boys vs. girls banked track battle, with the 202-141 win going to the ladies. But the Friday main event between San Diego and Phoenix will be the first time the greater derby community will get a peek into what man-on-man RDCL gameplay looks like. All other derby variants have had regular men’s play for quite some time, so men’s play is no longer unfamiliar to many. But it is hard to predict exactly what will happen when two closely-matched men’s teams take to the banked track in a way that few have ever seen before. RDCL rules rewards aggressive play, and men have no problem being aggressive when the situation calls for it. Being an exhibition, the only game both teams will play all weekend, one might think they would have nothing to lose by giving it their all. If how they play is anything like what women’s play looks like, with the faster speeds and harder hits that men are capable of generating, it has a chance to be absolutely spectacular. This potentially monumental event may also signal a shift in the RDCL. Until recently, men’s banked track roller derby was thought just as irrelevant as as the derby old-guard thought of men’s roller derby in general.6 But the financial realities of running a banked track league softened those views, with many coming to the inevitable realization that denying anyone a chance to play roller derby, banked track or not, is plainly dumb. To that effect, co-ed and men’s teams and rec leagues are beginning to have more of a presence among RDCL member leagues. Just a few weeks ago, San Diego opened a co-ed rec league for the first time. The OC Rollergirls have had a co-ed team for some time, but this year began to seek out enough men to form a separate men’s only team. With the Rattleskates’ continued presence in Arizona banked track play, and Penn-Jersey’s long-standing men’s team available, it may not be long until Battle on the Bank has a full-blown men’s division to go with the ladies and the juniors. Fast and furious men’s play may be more prominent at Battle on the Bank VIII, IX, or X. But first we need to get through Episode VII before seeing how men’s banked track derby plays into the future of the RDCL, and Battle on the Bank. Whatever happens this weekend, it should be a hell of a good show. Before building up its interleague program, San Diego did the same thing with L.A. and twice almost won the LADD championship. Okay, one other form of roller derby. The full details on how are available in our 2013 RDCL rules analysis. 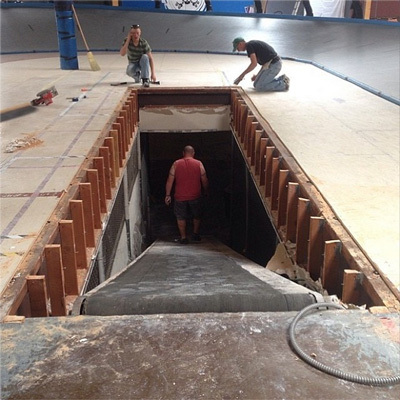 Founding RDCL member Arizona Derby Dames went through a similar flat-to-banked transition. Our friends from historically co-ed Penn-Jersey would disagree with that sentiment.